Why do you want to be Support? : Since starting in January, I've grown to love this server, but more so the community we have, and I want to help build it more, be it helping new players, returning players, or anyone who needs help with anything. What experience do you have? : I've been playing RS since 2014, in that time I've built a fairly strong knowledge of rs3 related content, from skilling, to most bosses with the exception of group bosses and telos. 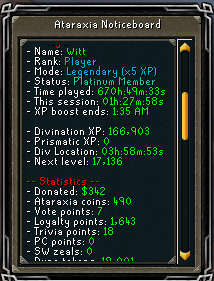 In terms of Ataraxia, I've gained a fair amount of knowledge in my time here, from the basics to end-game pvm. As for staff experience, I have a little but not much, I was a moderator on a small server for 4-5 months, and an admin on that same server for around a month. Why should we pick you instead of someone else? : I see myself as an approachable person, I thoroughly enjoy helping others out, and I know how to keep my personal feelings out of the way when dealing with any situation that might come up. I'm also very active during a hard to fill time slot. Other notes: I'm aware my forums activity is low, but I'm constantly lurking on forums and discord, but I'm always active in-game. You have some qualities that I believe could make you a great member of the team. You have been a tremendous help to the community and this shows with your POTM award. However, I would like to see some more forums activity in the future. That being said, I believe you would fit right into our current team.